Essay on the influence of music and caring individuals in the life of Dr. Friedberg and the at-risk youth served by our new 501(c)(3) non-profit organization, Hooked On Drums. 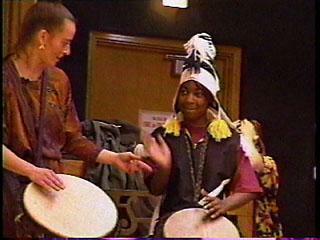 "Djembe: Drum with a Thousand Faces,"
"Teach the Children: A Report from the other Side,"
an autobiographical essay (1999). This piece is a submission to an (as of yet) unpublished book about women in drumming, edited by Jaqui MacMillan. "Where It Began: A Tribute to Silvia Kronewald"
The late Silvia Kronewald was a key member of Famoudou Konaté's European ensemble, and a pioneering djembe drummer and teacher who helped establish the European djembe scene in the '80s and '90s. This piece is a submission to an (as of yet) unpublished book about women in drumming, edited by Jaqui MacMillan (1999). "Rare German Radio Interviews with Famoudou Konaté,"
"Drumming for Dollars: The Bottom Line Between Appreciation and Appropriation"
"Manger Malade: 'Eating Disorders' and the North American Drum Community,"
a contribution to the conference, "Cultures in Motion: The Africa Connection" at the University of Tennessee in Knoxville (2003).